During the month of January I joined the Whole30 eating plan which restricted a lot of what I ate. I became very good at making items from scratch including sauces and condiments. When I first attempted homemade mayo it did not turn out at all. I researched a little, practiced a bit more, and finally it came out perfect. 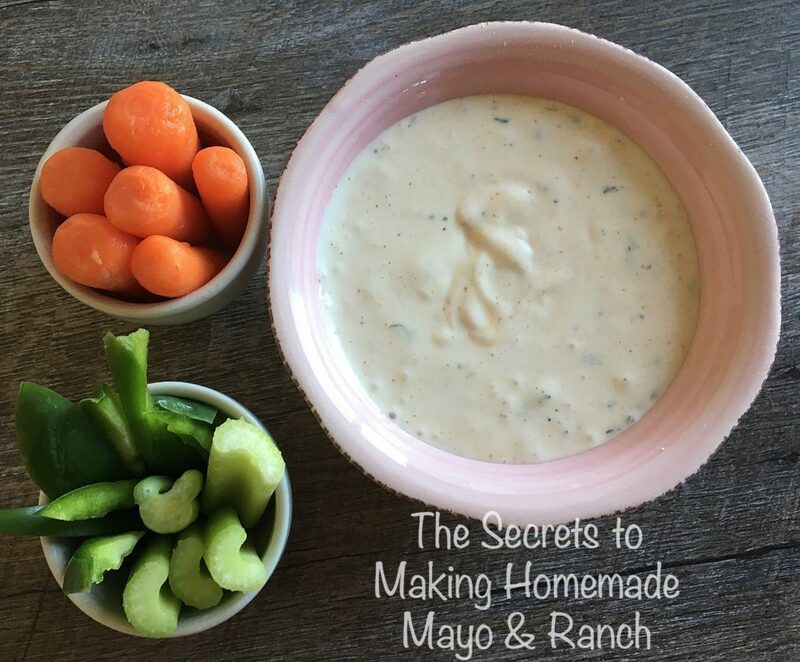 Today I’m going to share with you the secrets to making homemade mayo, which is also a base for ranch dressing, so you will get it right on the first try. It’s easy and yummy and you won’t want store bought again! My recipes are adapted from The Whole30: The 30-Day Guide by Melissa Hartwig. Mix 1/4 cup oil with all other ingredients, then slowly add in the 1 cup of oil. Know these before you begin. Only use extra light olive oil. I’ve heard that avocado oil works well too, but haven’t tried. NOT extra virgin. The flavor is too strong. Room temperature egg which means you have to plan ahead to leave it out. I’m not a good planner so I drop mine in a bowl of hot water for 5 minutes first. Use an immersion blender to mix. I first used a regular blender and while I made many mistakes during my first attempt, I didn’t use the regular blender again. The immersion blender is magic and I love it. Add in the extra 1 cup of olive oil very slowly. Sloooooooow. Add a little oil, mix up, add a little, mix. You got it. It will come out creamy and great! 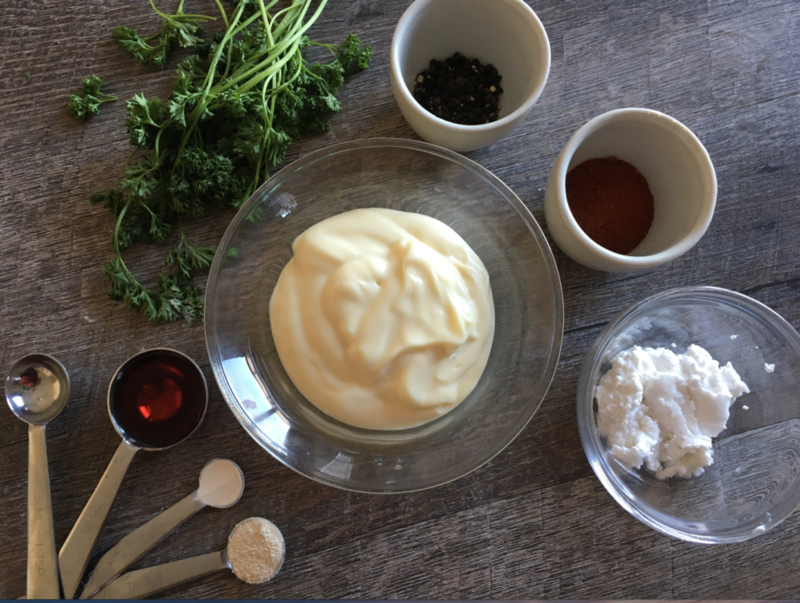 If you want to go a step further for Ranch, just keep adding the following ingredients into your immersion blender. 1/4 c coconut cream. Put a can of coconut milk into the fridge overnight and when you open it your cream is top to use. 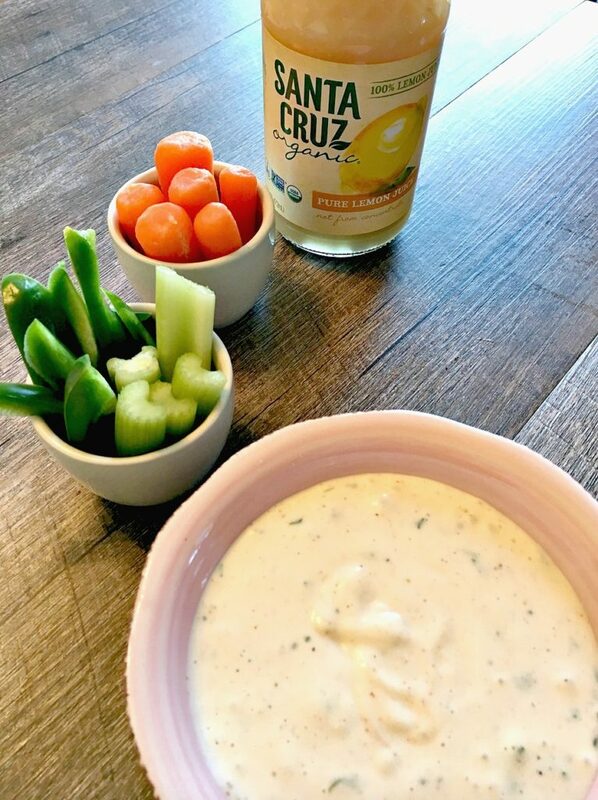 Test out my 3-ingredient Chicken Ranch Bites recipe with it. I use this ranch for everything! 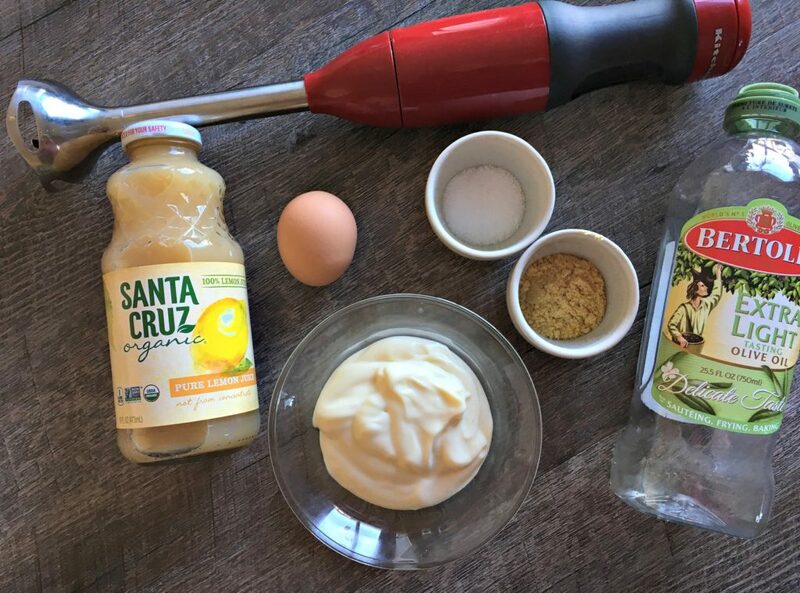 Did you notice I used Santa Cruz Organic Pure Lemon Juice in my mayo recipe? That is because it is 100% pure organic juice. It even comes in a glass bottle instead of plastic! Add flavor to everything from marinades, iced teas, salad dressings, to cakes and pies. Or just add a splash in a glass of ice water in the morning to energize and start your day. You can taste the difference pure organic lemon makes! Check out all the recipes at Santa Cruz Organic. All products are Certified USDA Organic Non-GMO Project® Verified. I hope I taught you my secrets to making homemade mayo. Now go try it! 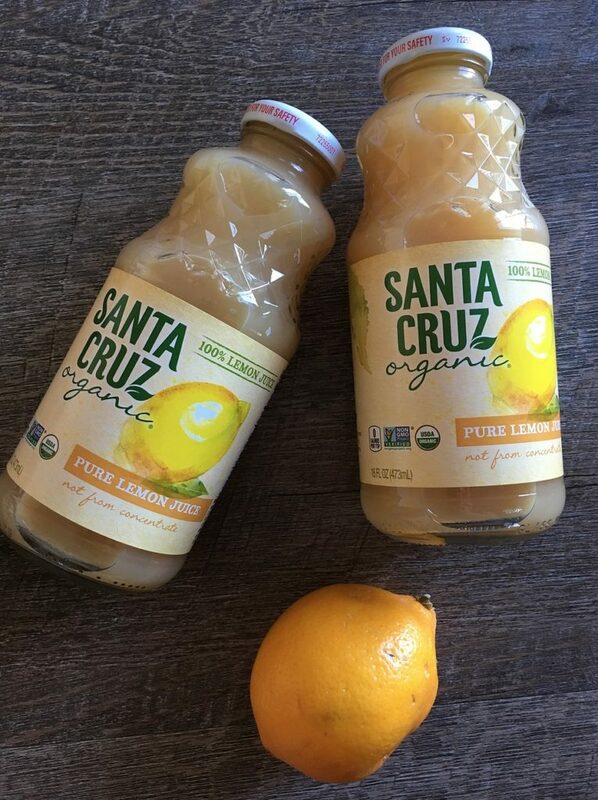 WIN 2 bottles of Santa Cruz Organic Pure Lemon Juice! I partnered with Santa Cruz Organic for this sponsored post. All opinions my own. Links may be affiliate. I use lemon juice in my iced tea. Why buy a mix full of chemicals when I can make my own! I use lemon juice to make my own lemon dill butter sauce for salmon. I use lemon juice in many recipes, lately, esp hummus and cookies! I'd love to try this! I have never made my own mayo1 Thanks for the recipes! I use lemon juice in marindes. I would use it in sauces for seafood dishes! We use lemon juice on fish, to keep sliced apples from browning and in recipes. Thank you! Thank you for the ranch recipe, love it! I use avocado oil and MCT oil (From NOW sports nutrition) when I don't want the oil's flavor to interfere with a recipe. I use lemon juice in my guacamole! The lemonades look so good, I'd love to try them. I use a lot of lemon juice in my cooking. Salads, bread, chicken to name a few. I'd love to try the Santa Cruz Chocolate Mint Syrup. I use lemon juice on salads, poultry, fish and in my homemade lemon meringue pies. I use lemon juice to make homemade lemon curd, in my fresh brewed iced tea and in many chicken recipes. I use lemon juice in many types of recipes, in baking, and smoothies! I use it in tea. I want to try their Chocolate Syrup!!! I use lemon juice for marinating fish and adding to salad dressings. I use lemon juice for cooking. Sometimes I will put it in soups or Mexican styled meals. I use lemon juice in my chicken recipes,cookie recipes,in my tea,and my salad dressing, I love it! I love anything lemon flavored. I use lemon a lot in my cooking and all my homemade salad dressings. YUM! I want to try the applesauce. I'd love to try out the Light Roasted Creamy peanut butter in a cookie recipe. It would be great to be able to try out the lemon juice with their Creamy Lemon Bars recipe. I use lemon juice in lots of chicken recipes! I almost always cook with lemon juice. It's e very healthy way to add flavor to all kinds of things. I use lemon juice in my tea. I also put some onto my veggies. We love using their lemon juice for anything from pesto, pastas, or in our tea or water. I like making my own lemonade and putting a little lemon juice in homemade applesauce to maintain the color. I'd like to try their lemonade and chocolate syrup. I use lemon in my tea!! I use lemon juice in tea, on fish and also when making fruit dishes, so they don't brown. I use lemon juice for my lemon chicken I make. I would love to try the Santa Cruz Organic White Grape Juice. I love organic lemon juice in green tea and on sliced organic apples. I use it in cooking and also as an astringent after washing my face. Thanks for the nice giveaway. I want to try the light roasted creamy peanut butter! I use lemon juice in a lot of recipes, but my favorite is to add some to my water. I use lemon juice when I bake. I also use it when I cook seafood. I use lemon juice when I can tomatoes in the summer and this would be great to try! I use lemon juice all the time in recipes and Santa Cruz is the only brand I buy, it's just a better quality than any other kinds I have tried. I use lemon juice in my salad dressing. Love their lemonade-would love to try any other!! I would love to try the lime juice. I want to try their Pure Lime Juice. Thanks for the contest. I am a lemon junkie! Iput it in almost everything! I'd love to try their Berry Nectar juice. We use lemon in a lot of things. Greek Chicken is one, and we cook a lot of fish. I drink lemon water first thing every morning to jumpstart my system. I try to use fresh squeezed but I always have lemon juice on hand in case lemons aren't available. Ooh! I love that it's 100% lemon juice. I use lemon juice almost daily. I make lemon blackstrap molasses drinks, spritz it on salads, use it in salad dressings, and really anywhere I can. I try to add a citrus/vitamin C source to my foods. I would like to try the peanut butter. Looks good. The lemon juice I use to make cool glass of lemonade. I use lemon juice in many sauces and salad dressings. I would also love to try the Rose Hip Infused Earl Grey Tea Lemonade from Santa Cruz Organics. I'd like to try their Agua Fresca! My favorite things to use lemon juice in are lemon bars or lemon meringue pie. I love lemon juice and use it almost daily! I like to put a dash of lemon juice in my ice water. Tonight's dinner is a Tex Mex chicken skillet---a main ingredient in the chicken marinade is lemon juice. I would like the Lime Juice. I use lemon juice for everything from making lemonade to cleaning with it. I like to add lemon juice to my ice water. I love Santa Cruz juices. They have many flavors that I enjoy.